If I were to write what my expectations of a first B&B experience should be....it would be Th Burgandy. Only thing more charming than the B&B itself ws Joe and Federico. So knowledgeable, easy going and completely charming. Nice breakfast, and a wonderful patio and Hot Tub! Kinda just wanted to move in an hope they didn't notice! Loved the neighborhood, easy walking distance to French Quarter and very close to a street car Line. Phoenix Bar nearby and fun. Thanks Joe and Fedrico for help making my bday vacation so perfect. Back to Chicago and thats a whole different review! The Burgundy is clean and comfortable. The host knows the city and gives great suggestions for activities. The location is a reasonable walk from the French Quarter, and there is plenty of fun in the adjacent Marigny District aw well. Breakfast is modest but there are many nearby options if you prefer a fancy breakfast. This place is very reasonably priced for such an intimate residence. I enjoyed our overnight stay at the Burgundy. It is close to food, and entertainment, clean, and private. The hosts are pleasant, and knowledgeable about the area, which was a plus for my husband and I. When visiting New Orleans we would stay here again. We stayed in the Green Room. Made a three day visit to New Orleans and we lucked out on this amazing B&B. Located next to the cultural heart of NO (French Quarter), the nearby CityCar station ($3 for a day pass) puts the city at your feet. The bedroom is clean and every room has nice shower/toilet. The owner Joe gives you a warm welcome, and makes sure you wake up to an excellent breakfast. 5 stars. We are on a roadtrip of the south states with a few days in NOLA from Norway. Supereasy with free street parking right outside for our car. Room is comfortably airconditioned and the roof fan lets you perfect the temperature. Close to everything, but the best part is the breakfast. Absolutely the best hotel breakfast we’ve had on this months trip on everything from fancy business hotels to B&B’s and roadside inns. Fresh fruits, european grade coffee and everything a breakfast should contain. Would absolutely recommend! We really enjoyed our stay at Burgundy Bed and Breakfast. I booked directly through the website and feel the value is excellent for the area. Parking was easy on the street, so there are no hefty parking fees as with other B&Bs and hotels. Joe and Federico are the new owners, taking over from Carl, now retired, who received great reviews for many years. The new owners are bilingual and able to provide great insight on food and fun in the area. The breakfast is lovely. Yummy jams, pastries, coffee, juice and even boiled eggs. And the presentation is quintessentially upscale B&B. We stayed in a room with two beds that was off the back sitting room. It was comfortable for three people. I was able to do a brief Skype meeting for work in the sitting room, and even captured a few orbs past my camera — something that happens often in high-spirited New Orleans! The back patio is nice to walk through, make a phone call, and delight in greenery. This B&B is located in a neighborhood, so there is a little neighborhood noise, especially a dog next door who likes to bark mid-morning. They have a washer-dryer and basic beverages for a fee. The establishment is fresh, clean and cozy. We look forward to returning, and I highly recommend! We enjoyed our stay here. The owners were quite friendly, and the home was cozy. Everything was very clean, the beds were comfy, and the room we were in was pretty big. I think Marigny is where it’s at as opposed to being right in the quarter. It’s not a far walk to get to the quarter, but being a little farther removed means that you can get a break from all the craziness while still being close to plenty of good food and bars. All the good music is on Frenchmen now anyway, which is only maybe a 10 minute walk. Thanks for having us Joe and Frederico! If you are going to be walking the river section of the French Quarter, or especially the jazz clubs in Frenchman Street, this is a well-located B&B in Faubourg Marigny. The hosts are informative and congenial, and the included breakfasts are very nice. Pool and hot-tub in the courtyard are nice and quiet. We had the best stay at the Burgundy B&B. The house is lovely and very well maintained. We loved the coziness and privacy of our room. The patio in the back is adorable! Joe and Federico were wonderful! They were so helpful to us and very accommodating. Joe supplies tons of info on great things to do in New Orleans. Also it’s walking distance to Frenchman Street and lots of great restaurants, cafes and bars! We can’t wait to go back for our next visit! 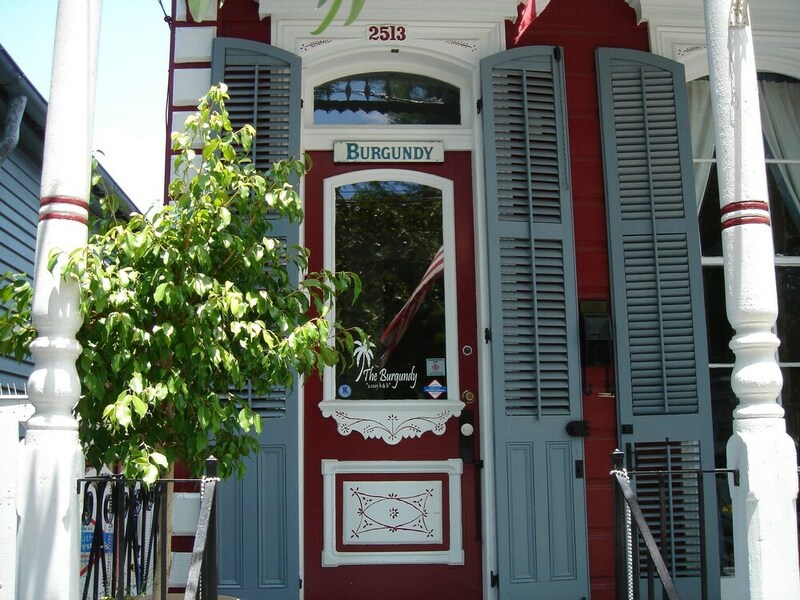 Located in Faubourg Marigny, The Burgundy Bed and Breakfast is within a 5-minute walk of Royal Street and within 15 minutes of other popular attractions like Frenchmen Street. This 3-star bed & breakfast has 4 rooms and welcomes guests with free breakfast, free in-room WiFi, and free self parking. A flat-screen TV comes with cable channels, and guests can stay connected with free WiFi. Other standard amenities include a ceiling fan and a desk. Limited housekeeping is available. At The Burgundy Bed and Breakfast, guests have access to a spa tub, free WiFi in public areas, and a library. If you drive, take advantage of free parking. Staff members are on hand to provide luggage storage and a safe deposit box at the front desk. Additional amenities include a terrace, laundry facilities, and a garden. Recreation features at The Burgundy Bed and Breakfast include a spa tub. A front desk is not available at this property. Guests with plans to arrive after 2 PM must make arrangements in advance by contacting the property using the information on the booking confirmation.